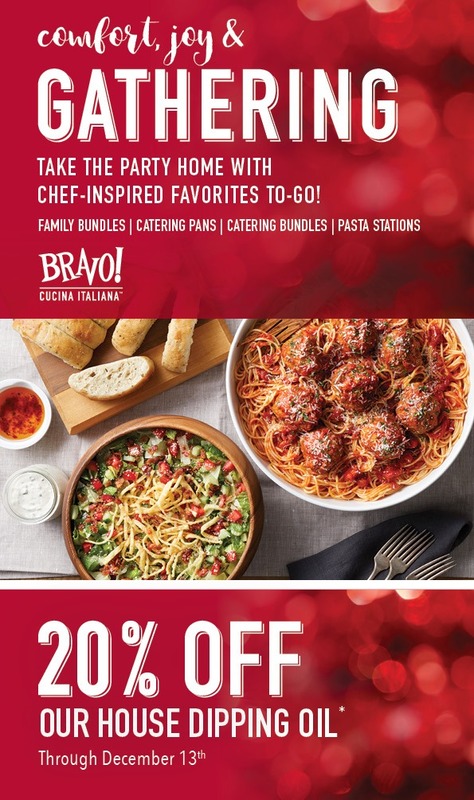 Take the Party Home with BRAVO Cucina Italiana’s Catering To-Go! Take the party home with BRAVO Cucina Italiana’s chef-inspired favorites to go! BRAVO has the perfect solution for your busy schedule, whether you need a meal for 4 or 50, with their catering to-go options. All bundles are served with your choice of entrée, either a Caesar, Chopped or Insalata Della Casa Salad and focaccia bread with dipping oil. A la carte appetizers, salads and entrées let you mix and match to make everyone happy. All bundles are served with your choice of entrée, pasta side, either a Caesar or Chopped Salad and focaccia bread with dipping oil. Includes your choice of two pastas, three sauces, three proteins, one salad and focaccia bread with dipping oil. Chafing racks, sternos, serving utensils and plates are also included.